Photo provided by Jiří Horák . The Historic Centre of Agadez has an original irregular street layout, which dates from its creation in the 15th century on the structure of existing Tuareg encampments. At that time, the Sultanate of Aïr started a process of sedentarisation and consolidation of various Tuareg tribes. The town became an important centre in the trans-Saharan caravan trade, linking the Maghreb to the Sahel. 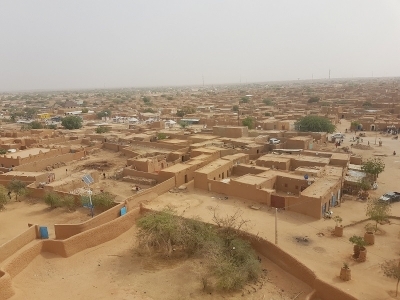 There are not many big cities in Sahara, so Agadez was always outstanding - it is located on the crossroads of trade routes North-South and East-West of the desert. Agadez was (and still is) treated by Tuaregs as their capital. Its tourist attractivity increased in the 1980s, with the increase of popularity of the Paris-Dakar Rally. Even at the beginning of the 21st century, every self-respecting globetrotter exploring West Africa stopped at Agadez, visiting nearby Tenere National Park and the Air Mountains. Air France maintained regular scheduled flights from French cities, and hotels and tourism experienced real desert in the city. Then, however, much worse times came to the region. In 2007, another Tuareg rebellion broke out in the region, destabilizing the province and bringing several hundred deaths. Although in 2009 peace was established (with Gaddafi acting as a mediator), but soon after that Al-Qaeda and Boko Haram messed up and the situation in neighboring Mauritania, Libya and Tchad suffered a drastic deterioration. It was better in Niger itself, but it was also dangerous to go beyond Niamey and the south of the country. Tourists left Agadez for a long time. At the moment, Western governments still issue red travel warnings to the whole Agadez region. But it turned out that Niger Airlines have regular flights from Niamey to Agadez so it could not be that dangerous and we decided to go. Ticket Niamey - Agadez and Agadez - Zinder costs approximately 330 euros per person (cannot be bought online yet so Nigerien fixer recommeded). In Agadez, we were expecting rather basic conditions but we stayed at Auberge d'Azel hotel, run by a French-Nigerien couple. The hotel turned out to be a nice surprise, with great kitchen, large rooms and well-functioning wifi. All at decent prices - I paid around 50 euros per night. An absolute gem was Agadez himself. 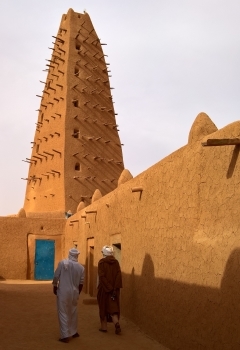 The city itself, in the opinion of all the locals (confirmed by us), is very safe, hence we could easily walk the streets and observe local life.The historical center of Agadez got WHS status as the buildings with clay and dried bricks remained intact for centuries. The center is really very nice, many buildings are thoroughly restored with help of Western European countries. The number one attraction is the central mosque with highest in the world minaret made of clay and dried brick. You can enter the minaret, but the staircase is really narrow. It is worth the effort, because you can admire the best panoramic view of Agadez from above. Near the mosque, you can buy legal and not very legal souvenirs - for example, dinosaur teeth, which are found in the area (by the way, some sites of dinosaurs in Agadez region are TWHS). My impression of Agadez was really good, especially because we were surrounded by friendly and smiling people. The city is really authentic and gives impression how Saharan cities looked like a couple of hundred years ago. My dream was to visit the Air and Tenere WHS, but the border requires at least 6 hours driving one way and is really not that safe (we had to hire local police even if we went outside Agadez for 20 kilometers). For now Air and Tenere becomes one of the hardest to reach WHS in the world. Agadez has been on my African agenda for a very long time, and it was only in autumn 2011 that I made my way to this remote Tuareg outpost in Niger's northern Air region.There were travel warnings in place by almost all western governments, and direct flights to Agadez have all been cancelled.The only practical way to reach the Sahel town was the early morning bus that leaves the Niger's capital Niamey at 4.30h. A sunrise to sunset expedition that usually takes 12 long hours. town for some Sahel adventure without informing the Police headquarters! The old town of Agadez is manageable in just one day by foot and the main attractions like the Grand Mosque, originally built 1515,rebuild in 1844, then the Sultans Palace, yes there is still a real Sultan residing here, and sometimes he even gives audience to tourists and visitors! The real charm of Agadez is to just wander around in its narrow sandy alleys, climb the old houses, the best view that can be enjoyed is from the roof terrace of a restaurant just opposite the Grand Mosque. Also worth a visit is the old bakery, la Maison du boulanger, its a perfect place to get a first hand impression how daily life must have been in the old days! I also visited the camel market, a little outside of town, but with excellent photo opportunities. Desert Cultural Landscapes: Crit iv "From the 15th century, Agadez, "the gateway to the desert", became an exceptional crossroads for the caravan trade." Berbers: The historic centre of Agadez dates back to the 15th and 16th centuries, when the Sultanate of Aïr established itself there, encouraging the consolidation of Tuareg tribes and the development of trans-Saharan economic and cultural exchanges. (Nom file) The city is still inhabited mainly be Tuaregs.